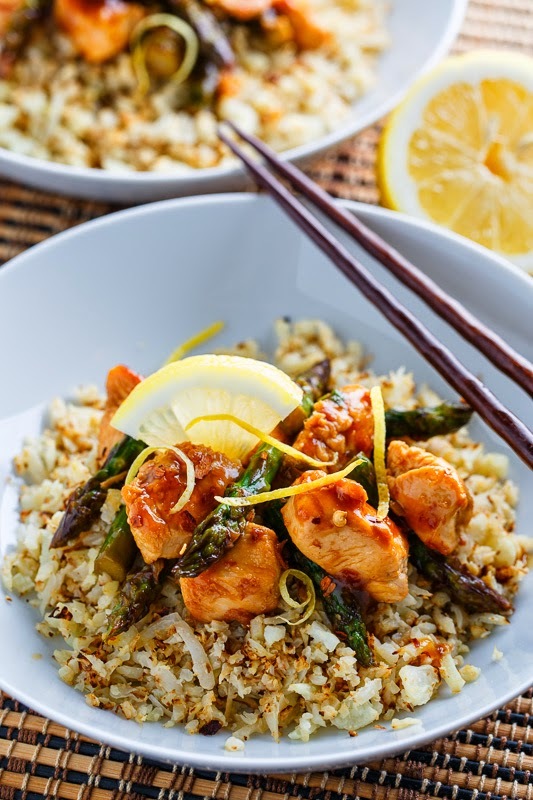 A quick, easy, light and healthy honey lemon chicken stir-fry with asparagus. With spring here I have been looking for lighter meals and you really can’t go wrong with a quick, easy and tasty stir-fry! One of my favourite Chinese takeout dishes is honey lemon chicken and this is my lighter and healthier homemade version where I stir-fry the chicken instead of battering it and frying it in tons of oil. The tasty sauce is what makes this dish shine and the lemon is just perfect for spring especially when accompanied by a spring vegetable like asparagus! This stir-fry is great for quick weeknight meals since it comes together in less than twenty minutes, which is less time than it takes to cook the rice! 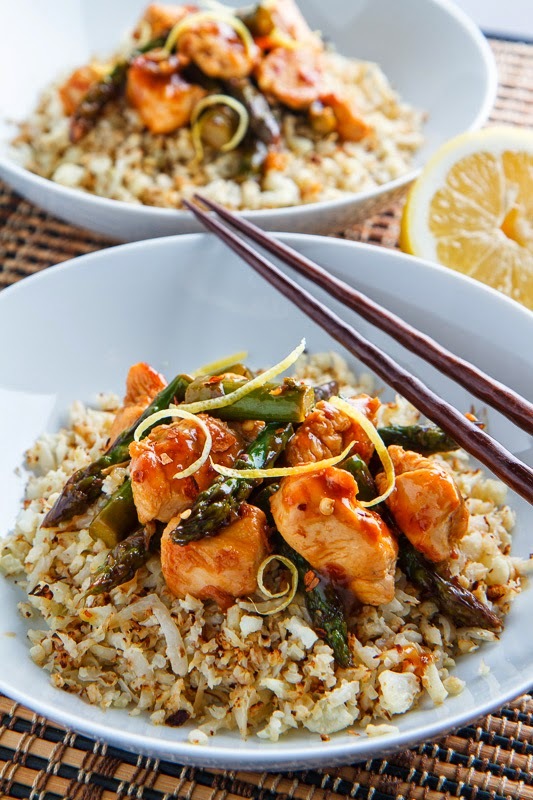 Speaking of rice, I often like to serve the honey lemon chicken and asparagus stir-fry on cauliflower ‘rice’ to make for a even healthier meal! Heat the oil in a pan over medium-high heat, add the chicken and stir fry until cooked through, about 2-4 minutes. Add the asparagus and stir fry until it turns a brighter green, about 2 minutes. Add the mixture of the honey, lemon juice, soy sauce, broth, chill sauce, lemon zest, garlic, ginger and the mixture of the water and the corn starch, toss to coat and cook until the sauce thickens, about a minute. Option: Add some cashews with the asparagus. This is my kind of dinner!! Perfect flavors! Kevin, this is really amazing, my idea of the perfect spring/summer evening dish. Love it! Wow, this looks delicious! Definitely a great spring meal with all the in-sesason ingredients!! OMG!!! I am so totally making this for dinner tonight! it looks SO good! Looks great. What is cauliflower 'rice'? Are you adding cauliflower to the rice or using cauliflower instead of rice? Sounds like the perfect weeknight dinner! Anonymous: The cauliflower rice is 'rice' that is made compeletly of cauliflower. Check back tomorrow for the recipe! I love the cauliflower rice idea, I definitely will be back for that recipe! Sounds good and I too am interested in the cauliflower rice. This is so me…thanks for being health conscience…You're the best! Love the lemon in this stir-fry Kevin – I bet it adds some nice bright notes! Great to see you at BlogHer Food! love this!! and love the cauliflower "rice"! will look for that tomorrow. . now, on to your orange chicken! love it! mmm!! I bet the lemon puts this recipe over them top! gorgeous pictures too. Thanks for sharing – this one is going on my menu this week! I bet the kids will love it. We made this last night for dinner along with the cauliflower rice. Both were fantastic. The flavors in the honey-lemon sauce were right on and just a bit spicy. I doubled the sauce, since we like lots of sauce, but it didn't really need it – the original amount would have been plenty. Thanks so much for this recipe – we will be enjoying this delicious dinner many times over. SEND IT TO ME? I WANT TO MAKE THIS RECIPE.